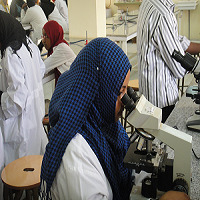 The aim of the program is to teach and train medical laboratory graduates in each specialty at a postgraduate level and to provide them with a qualification indicative of a high level of knowledge, competence and practical skills. The main objective of the course is to enable the participant to practice at a supervisory level in a clinical laboratory. The course, however, prepares the participant for other careers in clinical and scientific laboratories\ and healthcare administration. Participants are eligible to start their dissertation once they havebeen enrolled in the program, and they can submit the thesis for discussion once they pass the final semester two examinations. All teaching activities take place on Friday, Saturday and Sunday between 04:00 and 09:00 pm. Examinations take place on Friday, Saturday, Sunday and Wednesday between 04:00 and 09:00 pm. Detailed academic calendar will be submitted for participant once they have been enrolled in the program, demonstrating dates of all activities throughout the program.